Gabe Desmond is a Middlebury College junior majoring in environmental studies and philosophy. He has advocated for divestment as the co-president of the Sunday Night Environmental Group and co-chairs the Middlebury Environmental Council’s committee on carbon pricing. 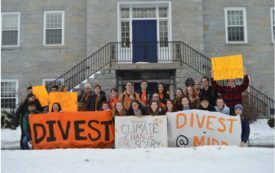 After Middlebury College rejected its students demands to divest from fossil fuels in 2013, students kept fighting—and now, the school has unanimously voted to divest.